On Thursday, the 9th of May, three dedicated learners took part in the Pick 'n Pay Spell Check Competition. They are : Andiswa Gumede, Cebo Mageba and Muhammad Arbee. The competition took place at The University of Kwazulu Natal and the children arrived there accompanied by Mrs Pfiel with great excitement. 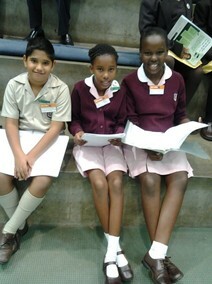 The competition got on its way at 9:30am and the learners survived four tough rounds of difficult spelling. Unfortunately, our three spellers did not make it to the final rounds. The day was enjoyed by all. Better luck next year to the three Top Spellers from RPS.